Dr. Anjali Bansal specializes in the area of Human Resource Management and Organizational Behaviour. Her current teaching responsibilities include facilitating the students in Change Management, Mergers and Acquisitions, Leadership and Organizational Dynamics at PGP level. She also teaches Research Methodology and Contemporary Issues in Management in FPM and in Online PGP courses respectively. Over the years, Anjali has served many committees including research committee, ICMC (annual international conference) committee, YRC (Young Researchers’ Consortium), rural immersion etc. Currently, Anjali chairs the Dissertation Program at MICA. She is also the Lead of the International Immersion Programs at MICA, responsible for managing students and faculty international immersion. Anjali has contributed to various internationally acclaimed journals, conferences, book chapters and magazine articles (browse ‘publications’ section). 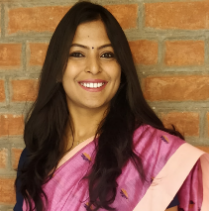 Anjali’s scholarly interests are ‘HR during change’, ‘mergers and acquisitions (M&A)’, ‘due diligence and integration during M&As’, ‘employees’ psychological phenomena’, ‘cross- cultural management’, ‘training transfer’ and ‘gender studies’. Anjali holds her Bachelor's degree in Biotechnology, and her Master's degree in Business Administration, and has been the university rank holder in both. She has earned her PhD in HRM-OB from FMS, Delhi. She has been awarded by UGC's JRF and SRF fellowships. Previously, Anjali has worked with University of Delhi, UPTU and IndiaMart Intermesh Ltd on full time basis. Anjali has also been awarded by Dr. Kiran Bedi for winning a university level chess tournament. Bansal, A. (2019, under review). Mergers in India: Correlates and Consequences of Communication Gap During Post- M&A Integration. International Journal of Human Resource Management. Bansal, A. Bansal, A. and Tripathi, A. (2019, under review). Portrayal of women in TV Advertisements: An investigation over Time and across Products from Indian Perspective. Journal of Advertising. Bansal, A. (2019, under review). Justice Contingencies during M&As. Journal of Organizational Change Management. Thakur, M., Kaur, S., Bansal, A., and Maini, R. (2018). Job Sharing as a Tool for Flexible Work Systems: Creating Opportunities for Housewives in The Indian Labor Market. Gender in Management: An International Journal, 38. Bansal, A. (2018). A study on Justice Contingencies during Mergers and Acquisitions. Proceedings of the 2018 International Academic Conference on Management, Economics and Marketing, Budapest, Hungary, 15-18 [ISBN-978-80-88203-07-0]. Bansal, A. and, Christian, A. (2018). A Study of Relationship between Entrepreneurial Drive and Self- Actualization Needs. Proceedings of the International Conference on Entrepreneurship & Family Business (ICEFB), Mumbai, India. Bansal, A. (2017). Training during Transitions: The Context of a Developing Economy. Advances in Mergers and Acquisitions, 16, (pp. 115-131). In Advances in Mergers and Acquisitions, 16, Emerald Group Publishing Limited. Bansal, A. (2017). A Revelation of Employee Feelings of Alienation During Post-Mergers and Acquisition: An Outcome of Perceived Organizational Justice. Journal of Organizational Change Management, 30 (3), 417-439. Bansal, A. (2017). Flexible Work Arrangements: A Revelation of Employee Feelings of Alienation. Proceedings of the International Research Conference on Sustainable Development of Human Capital: Exploring Perspectives from Grassroots to Global Research and Practice, Ahmedabad, India, 1345-1349 [ISBN-978-93-5288-411-7]. Bansal, A. and, Bansal, A. (2017). A Study of Glass Ceiling in Advertising. Proceedings of the 4th Annual International Communication Management Conference (ICMC 2017), Ahmedabad, India, 38-39 [ISBN No. 978-93-5267-935-5]. Bansal, A. and, Bansal, A. (2017). A Study of Gender Portrayal in the TV Advertisements: A Stereotypical Marketing Communication Approach, Proceedings of the 2017 Annual Conference of Emerging Markets Conference Board. Noida, India, 385-387 [ISBN: 978-81-928560-2-5]. Thakur, M., Bansal, A., and Stokes, P. (2016). The Role of Thriving and Training in Merger Success: An Integrative Learning Perspective. In Advances in Mergers and Acquisitions, 15, (pp. 1-35). Emerald Group Publishing Limited. Bansal, A. (2016). Employee Trust Dynamics during Organizational Change: A Context of Mergers and Acquisitions. Asia Pacific Journal of Business Administration, 8(1), 55-69. Bansal, A. (2016). A Study of Perceived Effectiveness of Talent Management Initiatives Imperative to the Psychological Contract of Contingent Workforce: The Context of India, Proceedings of The 13th Annual World Congress of Academy for Global Business Advancement (AGBA, 2016), Surakarta, Indonesia, 1-4. Bansal, A. (2016). People Matters: A Context of Mergers and Acquisitions. Proceedings of the 5th Global Business and Finance Research Conference, Sydney, Australia, 7 [ISBN: 978-1-925488-08-1]. Bansal, A. and, Khanna, K. (2016). A Study of Organizational Change and Employee Behavior: The Context of Marketing Technological Advancement. Proceedings of The 4th Annual International Communication Management Conference (ICMC 2018), Ahmedabad, India, 16 [ISBN 978-93-5254-804-0]. Bansal, A. (2015). Understanding the Integration Mechanisms Institutionalized During Organizational Change: Evidence from Five M&A transactions. Journal of Organizational Change Management, 28(6), 929-947. Bansal, A. and, Thakur, M. (2015). Training during mergers and acquisitions, its impact on employee satisfaction: Indian evidence. The Voice, 2(1), 59- 66. Bansal, A. (2015). Indicators of employee trust building during mergers and acquisitions. Proceedings of the 2015 IMRA- IIMB International Conference, Bangalore, India, 1-3 [ISBN: 978-0-9573841-3-2]. Bansal, A. (2015). Implications of unresolved soft-issues on employee commitment and satisfaction during post-merger integration. Proceedings of The International Journal of Arts & Sciences’ (IJAS) International Conference for Business and Economics, London, UK, 221 [ISSN: 1943-6114 :: 09(03):221–222]. Bansal, A., and, Thakur, M. (2013). The impact of perception of organizational transfer climate factors and trainees’ characteristics on training transfer: the context of mergers and acquisitions. Journal of International Business and Economics, 1(1), 50- 66. Bansal, A. (2012). Shifting the spotlight on the H-factor (human factor) during M&A: A study of correlates and predictors of successful mergers. Proceedings of the 5th Euro Med Research Conference, Montreux, Switzerland, 1. Thakur, M., and, Bansal, A. (2015). A framework of HR enablers for successful M&A integration: a study of three transactions. in the Routledge Companion to Mergers and Acquisitions. Routledge Publications, UK, 40-56. Bansal, A. and Bairoliya, A. (2018, August). Indian Backpackers’ Hostel on their Growth Trajectories. TravelBiz Monitor, pp. 18-19. Bansal, A. and Bairoliya, A. (2018, August). Indian Backpackers’ Hostel on their Growth Trajectories. HospitalityBizIndia.com. Bansal, A. (2019, January). Managing Contingent Workforce: A Pilot Study, International Conference 2019 on Human Resource Development and MSME Development, Jointly organized by Academy of Human Resource Development and Entrepreneurship Development Institute of India, Gandhinagar, India. Bansal, A. (2018, September). Training Transfer during Mergers and Acquisitions, In the Fifth International Academic Conference on Law, Politics, and Management (IACLPM, 2018) organized by International Institute for Academic Development, Rome, Italy. Bansal, A. (2018, March). A study on Justice Contingencies during Mergers and Acquisitions, In the 2018 International Academic Conference on Management, Economics and Marketing (IAC-MEM 2018) jointly organized by Czech Technical University, Prague and Czech Institute of Academic Education Z.S., Budapest, Hungary. Bansal, A. and, Christian, A. (2018, January). A Study of Relationship between Entrepreneurial Drive and Self- Actualization Needs, In the International Conference on Entrepreneurship & Family Business (ICEFB) jointly organized by IIT-Bombay, Shailesh J. Mehta School of Management, and the University of North Texas, College of Business, Mumbai, India. Bansal, A. (2017, November). Flexible Work Arrangements: A Revelation of Employee Feelings of Alienation. In the International Research Conference on Sustainable Development of Human Capital: Exploring Perspectives from Grassroots to Global Research and Practice organized jointly by Academy of Human Resource Development and IIM-A, Ahmedabad, India. Bansal, A. and, Bansal, A. (2017, January). A Study of Glass Ceiling in Advertising. In the 4th Annual International Communication Management Conference (ICMC 2017) of MICA, Ahmedabad, India. Bansal, A. and, Bansal, A. (2017, January). A Study of Gender Portrayal in the TV Advertisements: A Stereotypical Marketing Communication Approach, In the 2017 Annual Conference of Emerging Markets Conference Board of IIM Lucknow, Noida, India. Bansal, A. (2016, November). A Study of Perceived Effectiveness of Talent Management Initiatives Imperative to the Psychological Contract of Contingent Workforce: The Context of India, In The 13th Annual World Congress of Academy for Global Business Advancement (AGBA, 2016), Surakarta, Indonesia. Bansal, A. (2016, June). People Matters: A Context of Mergers and Acquisitions. In the 5th Global Business and Finance Research Conference, Sydney, Australia. Bansal, A. and, Khanna, K. (2016, February). A Study of Organizational Change and Employee Behaviour: The Context of Marketing Technological Advancement. In The 3rd International Communication Management Conference of MICA, Ahmedabad, Ahmedabad, India. Bansal, A. (2015, December). Indicators of employee trust building during mergers and acquisitions. In the 2015 IMRA- IIMB International Conference, Bangalore, India. Bansal, A. (2015, November). Implications of unresolved soft-issues on employee commitment and satisfaction during post-merger integration. In The International Journal of Arts & Sciences’ (IJAS) International Conference for Business and Economics, London, UK. Bansal, A. (2012, October). Shifting the spotlight on the H-factor (human factor) during M&A: A study of correlates and predictors of successful mergers. Paper presented at 5th Euro Med Research Conference, Montreux, Switzerland. Bansal, A. (2012). A Study of Factors Related to Integration during Mergers and Acquisitions: A Study in the Indian Context presented at EuroMed Research Business Institute, Montreux, Switzerland. Bansal, A. (2018). Start-ups in the India: the challenges and the avenues. Bansal, A. (2018). Survivors’ Training: A study of mergers and acquisitions. Bansal, A. (2018). Need Hierarchy of Entrepreneurs. Bansal, A. (2018). Managing Contingent Workforce: The Study of Six Indian MNCs.